The levator scapulae muscle is an elongated muscle present in the shoulder girdle. It acts as a connection between the upper limb and the vertebral column and can be located in the posterior triangle of the neck. Sternocleidomastoid covers the superior aspect of the levator scapulae whereas its inferior part is covered by trapezius and by its name it is easy to figure out that its major role is to lift the scapula. The levator scapulae muscle arises from the posterior tubercle of transverse process of cervical vertebrae (C1-C4). 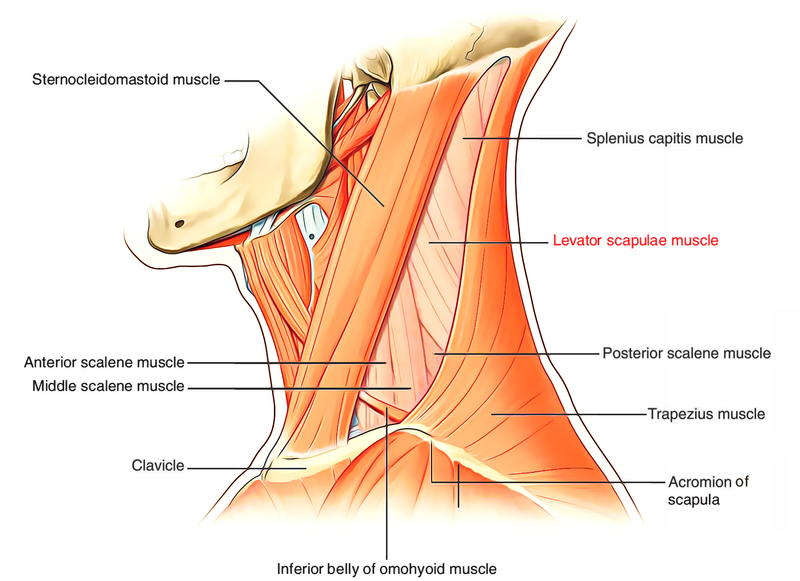 The levator scapulae muscle inserts at the superior angle and medial border of the scapula. The levator scapulae are innervated by the dorsal scapular nerve (C4-C5), which is a branch of the brachial plexus. Blood supply to the levator scapulae is carried out by the descending scapular artery. The name itself suggests, the major function of the levator scapulae is to provide elevation to the scapula. The entire scapula is simultaneously pulled medially by levator scapulae. This movement helps to bring back the elevated arm back to its neutral position. Apart from this, the levator scapulae also moves the inferior angle away from the back leading to a minor upward tilt of the scapula. If the scapula is stationary, a contraction of the levator scapulae causes the bending of the cervical vertebral column to the side (lateral flexion) and stabilizes the vertebral column during rotation. Forward head posture increases tension on the levator scapulae muscles to co-contract which leads cervical extension in an elongated position. Increased tightness in the levator scapulae due to more work taken from a forward head posture can lead to cervicogenic headaches.